Do I have a broken finger? How do I know for sure? Can I treat it myself, or am I best off visiting my local Minor Injuries? This article does its utmost to provide you with the essential knowledge to treat what is a quite common, but sometimes incredibly painful injury. This article details the correct symptoms of a broken finger as a means of assessing your own situation. It then goes on to discuss the correct and appropriate course of action should you wish to seek medical attention. You will find all the relevant treatment information right here, as well as some tips for looking after your finger as it heals. The bones in your fingers are called phalanges, and each finger has three of them (barring the thumb, which has two.) A fracture can occur in any of the phalanges, or in the knuckles, which are the joints where your finger bones meet. A broken, or fractured finger is a very common injury and you’ll usually need a month to experience a full heal. What causes a broken finger? This part is fairly obvious. With the amount of use we get out of them, it makes sense that the fingers have the highest risk of injury of all the parts of the hand. Common causes include falling awkwardly on an outstretched hand or being struck with an object. The severity of the injury and the strength of the bone affected are also factors that determine whether a break will occur. Dr Hajipour is fantastic! She performed surgery on my finger to sew my tendons back together. In only a few weeks my finger is almost back to normal! Dr Hajipour is obviously very skilled, she is very pleasant to deal with and talks you through everything very clearly. Highly recommend! Patient at BMI The Alexandra Hospital, 28th June 2018. To read more reviews please click here. Painful to move, or to touch. The pain will no doubt worsen quite significantly when you attempt to move your finger, especially if you try to form a grip on an object. Noticeably swollen in comparison to your other fingers. Visible bruising around the point of the fracture will appear very quickly, almost immediately. This happens because when a fracture of any sort occurs, the fractured fragments will bleed into the tissue. It’s what forms the bump and bruising. Difficult to move. A slight loss of motion and ability in the finger is common. It’s less common for someone to experience a complete loss of motion in a broken finger, and this is usually an indication of a more severe fracture. 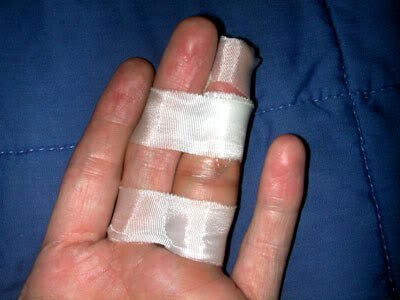 A broken finger will generally remain usable, albeit through intense acute pain. Visibly wonky. It is a broken finger, after all. It may be apparent that your finger is deformed as a result of the injury. With more severe broken fingers, you may experience the end of the bone piercing the skin. This is what we call an open fracture. Giving you a tingling sensation, or feel numb. This occurs as a result of the restricted blood-flow to the finger. Insufficient healing. This can lead to weaker bone structure and disfigurement. Loss of motion. You may not retain the same ease of use in the afflicted finger. Disability. In severe cases, you may completely lose the ability to use the afflicted finger. Head to your nearest Minor Injuries Unit for a full diagnosis and treatment help. Not sure where your nearest one is? Click here. Minor finger breaks will often be treatable here. Of course, in the event of a more serious finger fracture, you can visit an A&E department at your nearest general hospital. This is advised in the event of an open fracture. Has the fractured bone pierced the skin of your finger? Please be sure to stop any bleeding as quickly as possible, using sterile items if possible. You do your best to stop a wound from bleeding by applying consistent pressure with your chosen dressing, cloth or pad. If the wound is open then this will need to be dressed. While you’re seeking out medical advice, an ice pack will most likely be an essential to help treat the first wave of symptoms. Gently hold a soft cold compress against the finger and this will help reduce the swelling and pain. If you only have a hard ice pack, then wrap it in a wet cloth. It is highly recommended that each household has a cold compress in the freezer for any type of medical emergency – and most businesses will have one as part of their health and safety regulations. If you’ve suffered the injury when out, then don’t hesitate to ask someone for assistance. While this is uncommon for broken fingers, it is worth mentioning that more serious fractures may require surgery upon arrival at the hospital. If you believe that the condition of your finger might qualify you for this scenario, then it is advised that you don’t eat or drink anything so you’re ready to go. Other FAQs ahead of an upcoming surgery can be found here. Try your best to rest the broken finger as much as you possibly can. Avoid moving it as much as you possibly can, as this will only aggravate your symptoms further. In the same way that a broken wrist can be helped by being put into a sling, you may wish to consider gently securing your broken finger to the one next to it. Miss Hajipour was absolutely fantastic with me. As a very active person I was feeling incredibly anxious about my injury and Miss Hajipour thoroughly and very thoughtfully explained the process. She was genuinely very caring and her professional approach and treatment had me discharged sooner than I could ever had expected. I trust Miss Hajipour implicitly and highly recommend her. Patient at BMI The Alexandra Hospital, 3rd June 2018. To read more reviews please click here. When you arrive at the Minor Injuries Unit or A&E, you will be assessed by a trained practitioner who will help diagnose you and determine what treatment you need. Generally, an x-ray will be performed and this helps confirm that your injury is indeed a broken finger, as opposed to a sprain or a dislocation. As mentioned before, the symptoms are shared. While you wait, you will be administered with mild pain medication and your finger will be fitted into a splint. This helps to maintain the finger in a healthy position. If the x-ray does determine that the finger is indeed broken, then the images will also provide an insight into the location of the fracture. This will help the doctors to give you the correct treatment. The most common treatment for a broken finger will be a removable splint, and these are sometimes applied a few days after the break to allow for the swelling to subside. Before the splint, the bone may need to be realigned, which is the process of moving it back into place so it heals correctly. You’ll be on your way once the splint has been put in place, and a follow-up appointment will be booked to check the progress your finger is making. Surgery may be required if the finger fracture is severe, as this will usually mean that damage has been done to nerves or tendons. Wiring, or screws may be utilised to help restructure your finger and bring back some mobility. A plaster cast will be applied post-surgery to help keep the finger in the correct position while it heals correctly. A broken finger will usually take around a month to heal – minor fractures can heal in as quick as a fortnight, while more serious fractures could require up to two months. It all depends on the severity. Although the finger may be healed, it will still take a further month or so for you to rebuild the strength in the affected finger. Avoid using the affected finger as much as possible. This will disturb the finger splint and you will run the risk of deformity. Take household medication, namely paracetamol, to ease the pain. These are available over the counter. Hold your cold compress against the finger for small, 10 minute periods 3 or 4 times a day. This will help ease the swelling. Struggling to recover from a broken finger? Miss Ladan Hajipour is a specialist hand and wrist surgeon, and would be happy to receive your enquiry. Fill in the contact form below if you need to.